The importance of group exams! For generations LAMDA was renowned for its individual Acting examinations however the group exams have a multitude of benefits that cannot and should not be overlooked. They allow every child to shine, every child to play to their strengths and use their individual vocal and dramatic talents within the group piece. They are marked as a group. This is fundamental……..the success of any project is always a team effort and not individual performances. The Olympic cyclists and rowers and athletes pull together as a team and medals are won for Great Britain as a whole. Yes individual performances stand out but it is how the team works together that counts. It is the same on the West End stage. A review is written about the entire cast, the group together, this is theatre! TRUE Theatre. There will be individual star performances but it is a group, team, effort that attracts success. That involves not just the performers but the entire technical team and production teams too! If you are going to follow a career on the stage you very rarely work ALONE – in fact you don’t. Even a one woman show makes demands that you work with others in the theatre; the director, the stage manager, the crew! Sometimes things go wrong and it is how the team works together that enables the show to go on. At Little Voices we are committed to building fundamental life skills in children and young people. 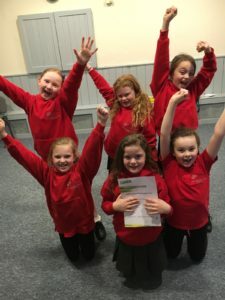 Techniques and behaviours that will set children up for life…….of course this is inbuilt into singing and drama lessons in the most fun and highly structured way possible! However all of these skills are easily transferred into life in general and a career path into the arts! We all have to work as part of a team within our job roles in later life and learning to work as part of a cast in a piece of Musical Theatre for a group examination really does teach the fundamental life skills of teamwork and playing to your strengths, being reliable and supporting each other. Individual exams have their very important place but when weighing up the benefits the group exams have all the elements of solo exams and for children aged up to 13 years they provide a fantastic examination foundation in musical theatre or acting.